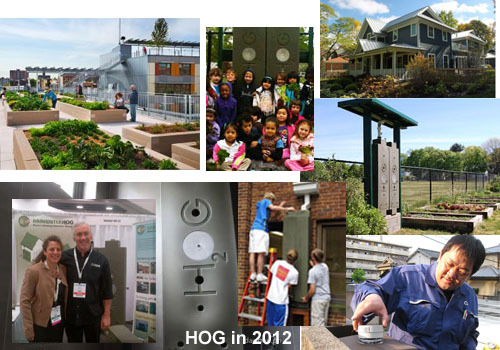 Rainwater HOG had a productive 2012, watching our customer base expand and sharing the bounty of rainwater harvesting across the U.S. and internationally in a variety of venues – from big city affordable housing developments to big island affordable housing developments, from elementary schools to LEED Platinum homes, and from contests to conferences. 2012 was the hottest year on record in the USA, further establishing the increasing effect of climate change on the planet. With global warming comes an increase of extreme weather events, such as what Australia has been experiencing – flooding fast on the heels of an unprecedented heat wave and bush fires. The Whole HOG’s much referenced science guy, Robert Krulwich turned us on to what he calls “Miss Piggy’s version of global warming” wherein scientists (at the New Scientist website) published an interactive graph that answers the question, ‘What about me?’ Use the New Scientist App to click on a map of the world, anywhere in the world, and see how the temperature has changed in that location since 1950. A chilling – or should I say fever-inducing – illustration of climate change close to home. As we enter 2013, we’re thinking about water (in light of global warming) from three different perspectives: personal, national (apologies to our international readers for our American-centric leanings), and global. We’re taking the Miss Piggy approach direct to your roof with the rooftop rain harvest calculator. This app from Save the Rain lets you find and highlight any roof in the world visible from Google maps (preferably your roof) to figure out how much rainwater it could be collecting annually. A farm in Southwest Colorado, one close to this writer’s heart (it belongs to my mom), where the average annual rainfall is 11.81 inches could be collecting approximately 10,643 gallons a year. That’s 4,447 toilet flushes. How much could you collect? In 2010, 80% of Americans believed our water system needed reform. In 2012, that percentage has grown to 88%. Seventy-nine percent of the American public recognize that demand is growing and water is becoming scarce. But, the factors contributing to a water crisis remain hazy for many. Click on the graph, pictured left, for more. Unsafe water sources and poor sanitation make the water crisis in developing countries more visceral. Often there is inadequate infrastructure to serve large urban populations, as in Freetown, the capital of Sierra Leone where a population of 2 million people live in a city with an infrastructure built for half that many. Photographer Mustafah Abdulaziz focuses on the role of water as a carrier of epidemic and disease in a thought-provoking project, funded by the Pulitzer Center, called “Water is Gold”. In it, he documents the aftermath of the worst outbreak of cholera in Sierra Leone’s history. “Have you taken it to the breaking point?” asks Chuck Henderson, designer of conic shelters (conics, for short). That question led to a computer-generated structural analysis of an 80′ x 40′ conic shelter, weighing 80 tons, which was shown to support 13,000 tons before collapsing. Keenly aware of the repercussions of global warming, Chuck is designing gorgeous, and ruggedly versatile architectural shelters – conics – on the cheap. Why is it beautiful? These conical structures, built from thin materials like plywood or reinforced ferro-cement type concrete, adhere to basic geometric formulas. 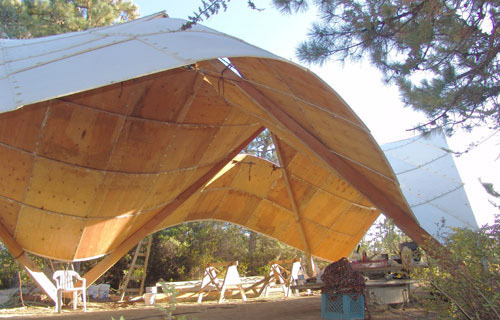 The conic shell flexed into striking curves ‘acts as sheathing, structure and roofing’ of the shelter. The soft waves of the roofs evoke the swoop and rise of mountaintops, molded by wind and weather. And just like those mountain ranges, conics are built to withstand extremes. Why is it useful? “Our goal is to create minimal structures with maximum structural integrity in all loading configurations – hurricane, earthquake, snow, even tornado,” explains Chuck. 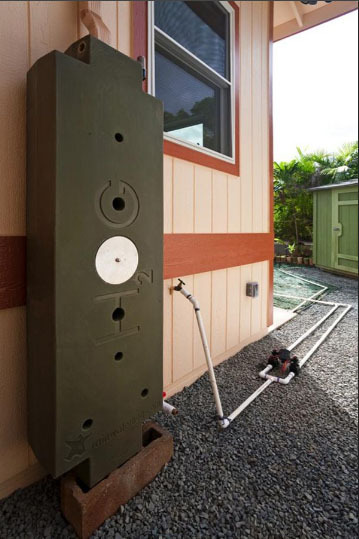 His continued emphasis on performance testing conics for flexibility and durability – they dot his property outside of Gualala, California in various configurations and stages of completion – allows him to develop stronger, cheaper solution for shelter. Why is it green? Conics are multi-purpose shelters, as likely to appear as open-air workshops as enclosed living spaces. Not only are they designed to be durable, they’re easy and affordable to construct, requiring a minimum of building materials. Conics have made appearances at Burning Man, and multi-unit conic villages have been proposed for refugee or homeless shelters. This is just the kind of visually and structurally strong, environmentally-conscious housing solution of which we’d like to see more!